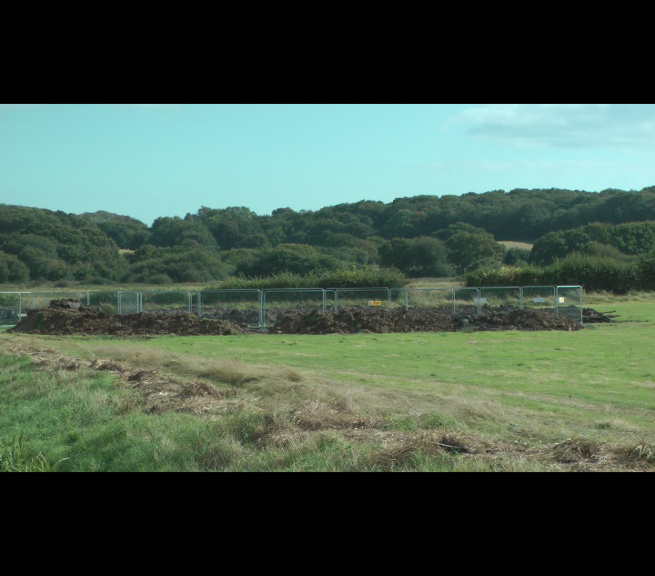 Is the Bexhill Link Road going through the UK’s most important battlefield? 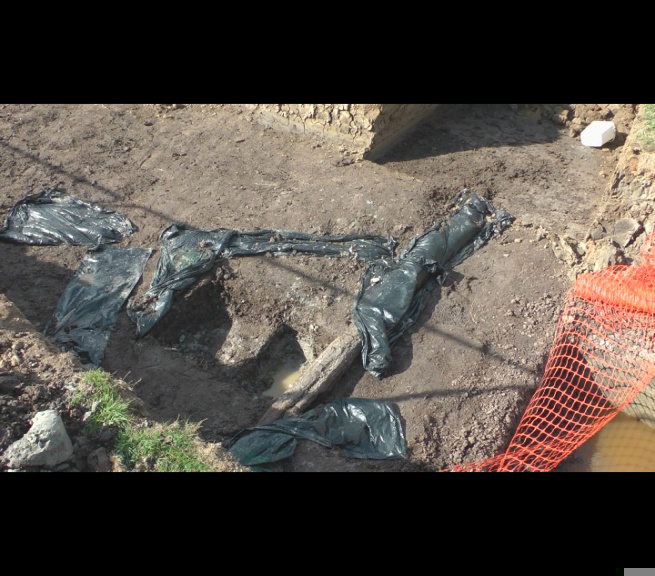 With all the recent news surrounding the excavation of Richard III in a Leicester social services car park, one is given to wonder what exactly galvanises the interest of academics and the public these days. How about the smouldering controversy over that most famous date in English history, 1066? Could it be that most of what we thought we knew about the Norman landings and subsequent battle is wrong? Could it be that Harold and William have unfinished business, not with each other this time, but with East Sussex County Council and their road-planning department? It’s time to do something because we care. 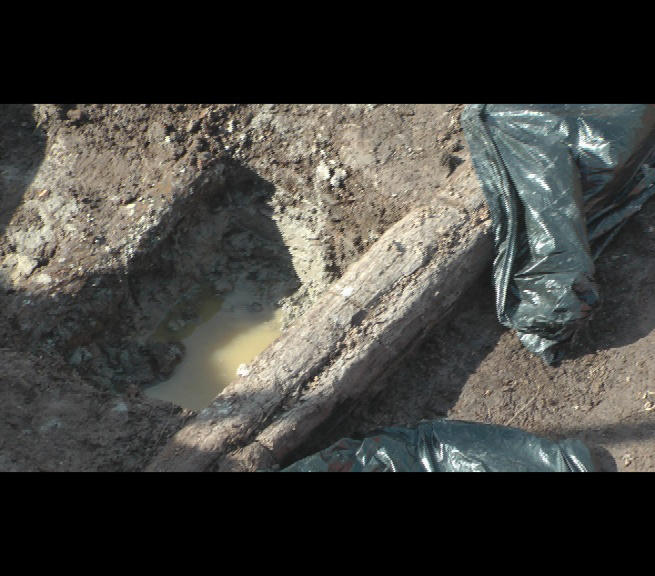 The County Archeologist tells me that the timbers found on the marsh in Trench 79 are definitely not a boat. Oxford Archaeology are recording the exposed wood and surrounding deposits and taking samples for Carbon 14 dating – which is excellent news. The wood in question sits below the top of the silt layer and this suggests to me that it must have arrived there before the Combe Haven was closed to the sea (1294) making the wood either Norman, Roman or part of the Bronze Age settlements referred to in my book – confirming the major importance of this valley in heritage terms. If the timbers are not part of a boat they must form part of a causeway or settlement that entered the marsh like at Shinewater down the coast. The answer will of course be confirmed by the date. The location is directly opposite Bynes Farm Boomery site (within only 300 yds) which may explain why Roman may also be on the map of possibilities. Proper archaeology standing on this road route that should not be built over. If they are prepared to build over this sort of archaeology they will build over anything. 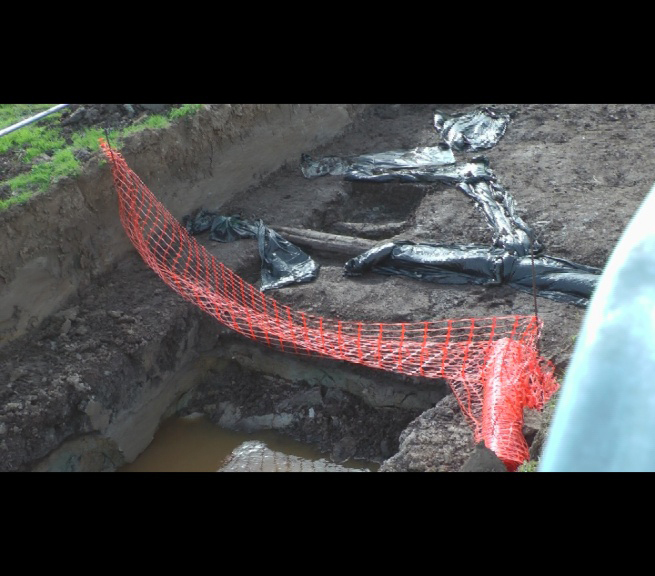 It has been reported that medieval boat timbers have been found by Oxford Archeology on the A259 road route in the Combe Haven valley – opposite Byne Farm. These must be pre 1294 the date when the great storm when the valley was closed to the sea – stay tuned. In order to get into twitter and social networking I have posted all the Norman Invasion group posts into the Secrets of the Norman Invasion Blog. There are lots of people who do not use Facebook, especially in the workplace and there is no special restrictions on the Blog so everyone can come in. We also get stats and can put all the videos and discoveries in one place. I would therefore like to invite everyone to follow what is happening on twitter on the Blog and get the tweets as it happens. You can also share any post by clicking the share (press this) button below each article. Pass the word on. Best wishes Nick Austin (site admin). Hi Nick,I’ve been following your work & website with a great deal on interest. I think your arguments for the landing site and the location of the Malfoss as being very persuasive. I hope you are able to find concrete proof. Charles verified the site by finding that the waste left after the battle was in fact recycled by the Vikings into new weapons & armour & it was this residue from the smelting operation that helped clinch it. Like you though Charles is fighting to save the Fulford site from developers. 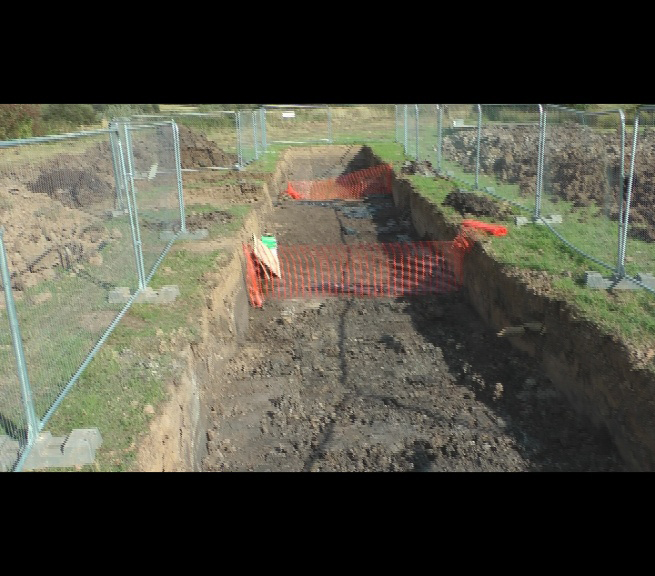 Nick: this gives some idea of the difficulty we face – no recoverable iron objects found to date on any battlefield of this age etc and why earthworks are so important. Though things have been a little quiet here for a few days, the wheels of progress are turning. I’ve been down to Wilting three times in as many days to continue with the scanning of the upper fort site. I’ve been using a non-ferrous detect to concentrate on picking up any unusual jewellery or gew-gaws that could have been dropped within the fort perimeter relevant to the period. “Little evidence could have survived the 938 years separating us from the battle on 20th September 1066 [Fulford], they pointed out. Medieval battlefields are not artefact-rich environments. The armies arrived, fought, died, fled or marched away after a few hours. The combatants came clad in iron armour, clutching iron weapons. Such ferrous fragments that survived the attention of scavengers would rust, so the material is not popular with archaeologists or conservationists. No site of this antiquity has so far yielded a recognizable weapon…. Three battles were fought in 1066: Fulford (Norway v. northern English eorls), Stamford Bridge (King Harold v. Norway) and Hastings (King Harold v. Normandy). Of the three, only Hastings shows evidence in the literature of having substantial structures relevant to the site. Also, the Hastings site in general is vast, taking in the port, landing areas, two forts, the Crowhurst abbey and battlefield itself. It’s pushing it a bit to imagine nothing of significance remains. Troops often buried personal stuff before going into battle. If they subsequently died, no-one went back for the stuff. Nick wants to find some Norman pottery, possibly in surviving postholes, which would be conclusive. Today I unearthed a third bronze ring which could be a horse bronze, we’re not sure yet. All three are heavily accreted and found reasonably deep. Some other curious artefacts have also come to light which are gracing the tank as we speak. We’re after the elusive find which will prove the game-changer. We’re also after the bodies. In the two weeks leading up to the Battle of Hastings itself, William and his comitatus would have been in constant planning. We know that such planning would have taken place at William’s camp at the upper fort. We also know that provision would have to be made for the burial of Norman casualties if William won the battle. Poitiers indicates that the subsequent Norman dead were buried before Harold’s body was returned to William’s camp (at the upper fort at Wilting). That being the case, did William go to the trouble of carting hundreds of his dead nobles two miles back to Wilting, or did he inter them at the field? Investigations are continuing….